There are many ways to make your mark on the world. Be a great leader or a loyal friend. Write books or right wrongs. But always do it your way. Some fear the future. Others drive it. 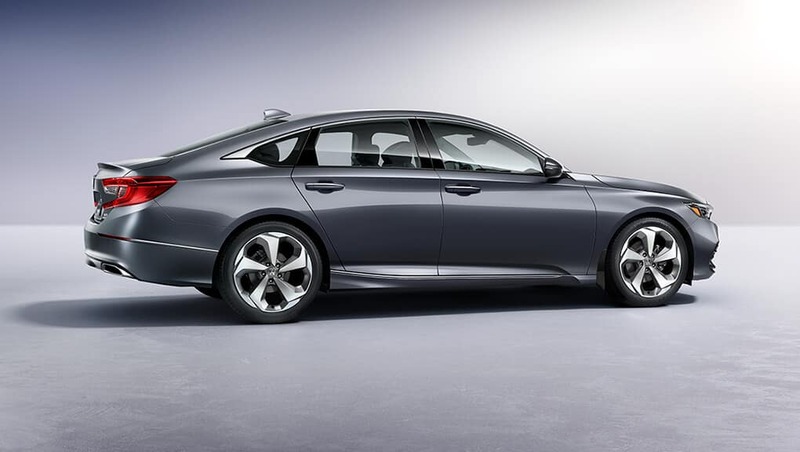 The Accord, like those who drive it, embraces change. We don’t just think about putting our drivers behind the wheel. We think about putting them behind pure dynamic power, with a striking, boldly redesigned exterior. When buckled in, you’re surrounded by style, performance and our latest available tech features. 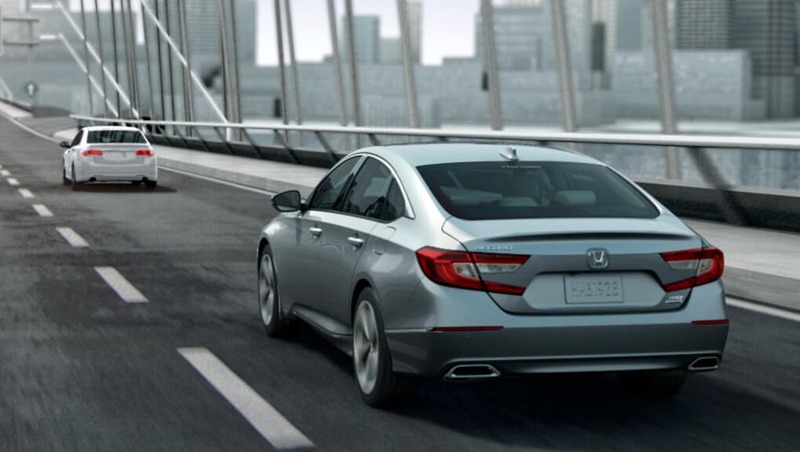 When you’re ready for more, the Accord is ready for you. The most impressive Honda ever. You can’t build a legacy by staying put. So even after countless awards and trophies, we continue to push the limits of innovation. 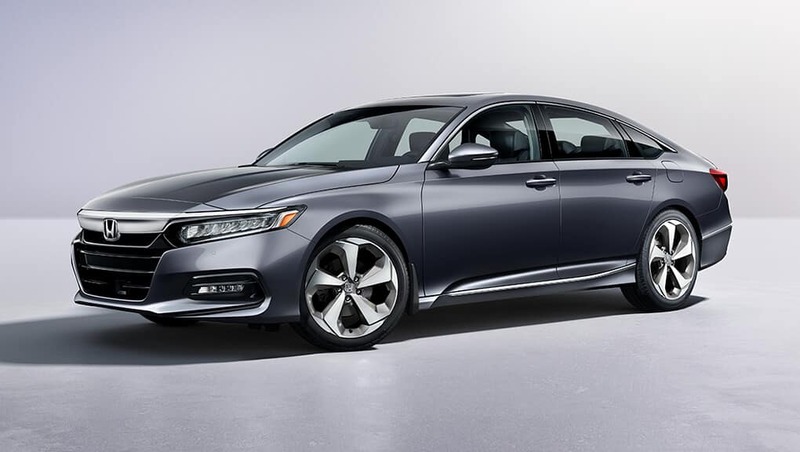 With new turbocharged engine options and a European-inspired fastback design, the all-new Accord sets a new standard for sophistication and excitement. 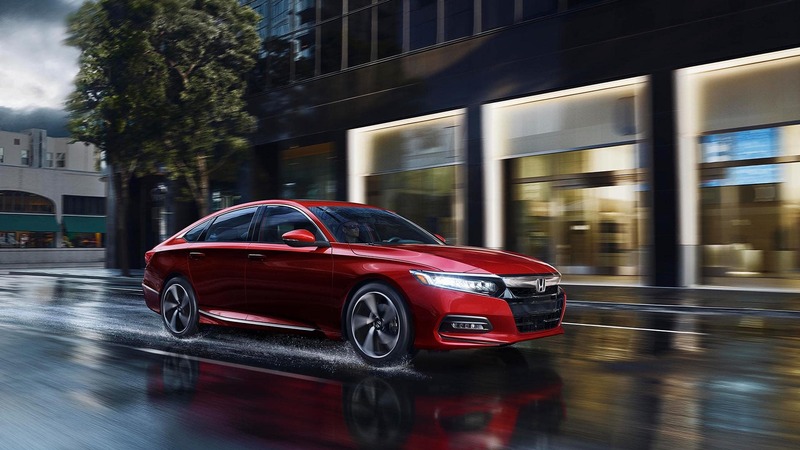 The all-new Accord has an all-new look, from its bold angles to the aggressive chrome grille. Whatever your budget and your needs, you’ll find there’s a trim that will fit the bill—and then some! Half art, half science. All style. 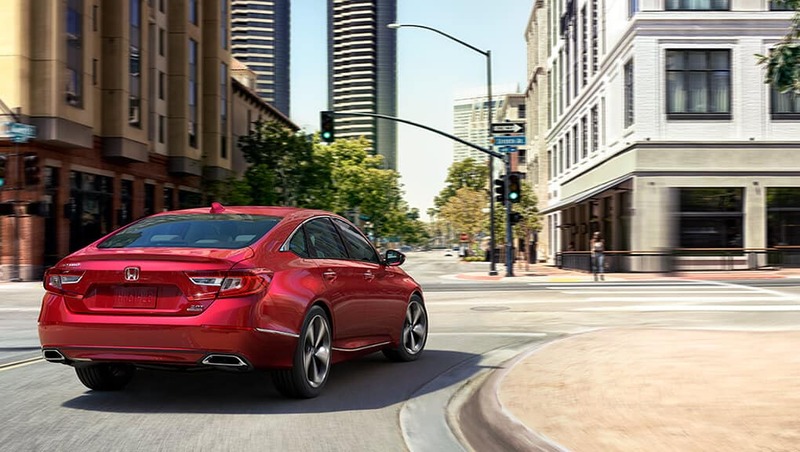 With its dynamic angles, wider stance and longer wheel base, the newly-redesigned Accord attracts stares from every direction. The chrome grille, available chrome door handles and available dual chrome exhaust finisher add a luxurious touch to the sporty, aerodynamic exterior. 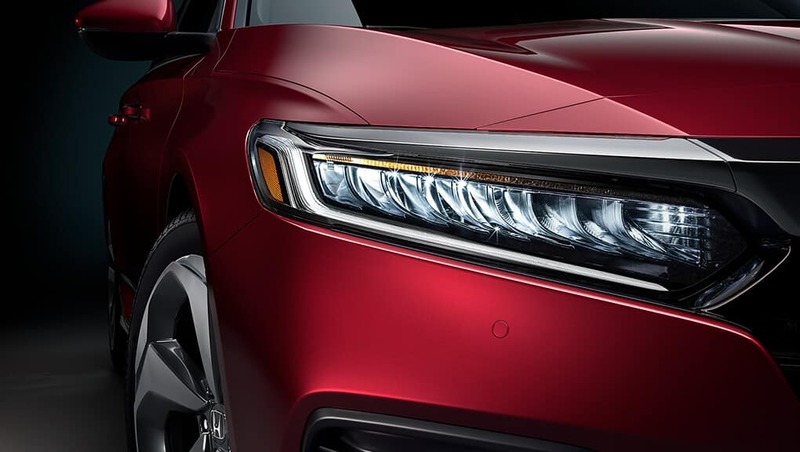 The LED headlights with auto-on/off, LED taillights and LED daytime running lights add to its sharp looks, making you feel like the only one on the road. 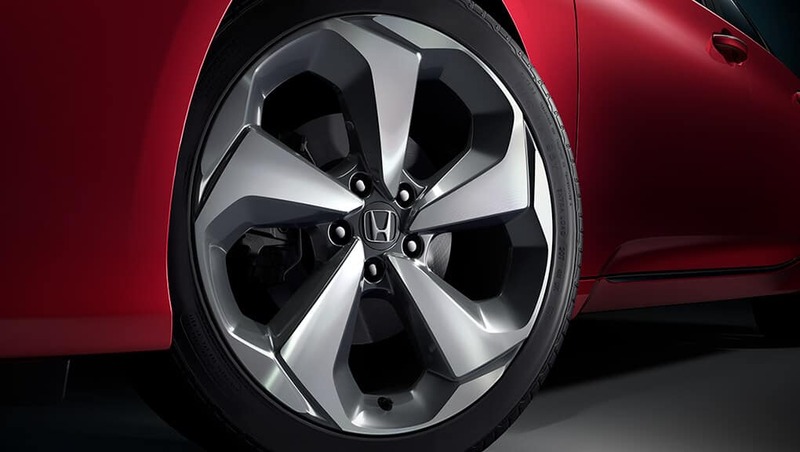 Speaking of the road, the available 19″ aluminum-alloy wheels add yet another element of style that’ll make everyone’s head spin. Once you’re in, you’ll never want to get out. 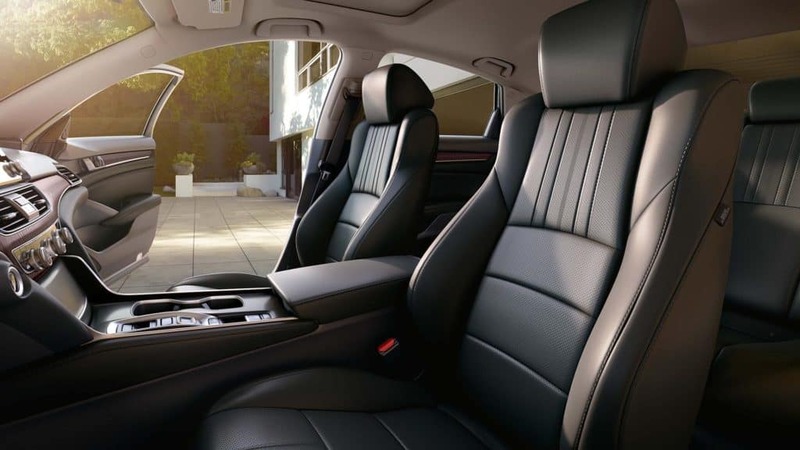 Boasting segment-leading rear legroom, the Accord also features heated front seats with available ventilation and available heated rear seats to keep everyone happy. If you enjoy the finer things, you’ll love the available heated leather-wrapped steering wheel and the available leather shift knob. When you’re ready to get on your way, the proximity key entry system with pushbutton start lets you grab a front door handle to unlock, and push the start button to go. 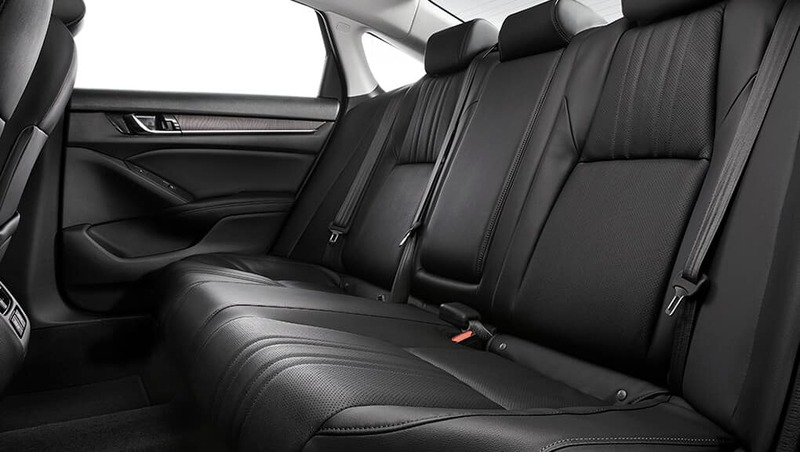 The convenience continues with the 60 /40 split fold-down rear seatback, while the driver’s seat adds support with 12-way power adjustment including 4-way power lumbar support, making your seats more than just something to sit in. Don’t be shy. Say hello to luxury. Great style means great aesthetics. Cue the available 19″ aluminum-alloy wheels. 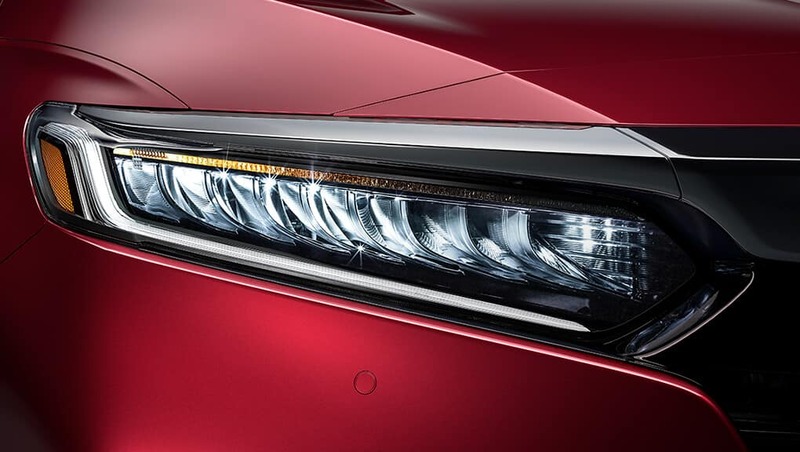 The LED headlights, LED daytime running lights and the LED taillights were designed to help you see, and be seen. The sleek design is engineered to better illuminate the road and help you arrive in style. 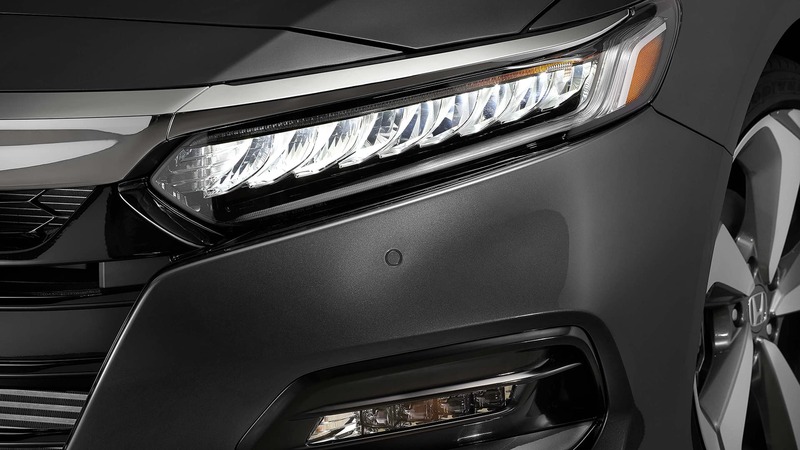 The available LED fog lights will help add an extra element of style and safety to your Accord. 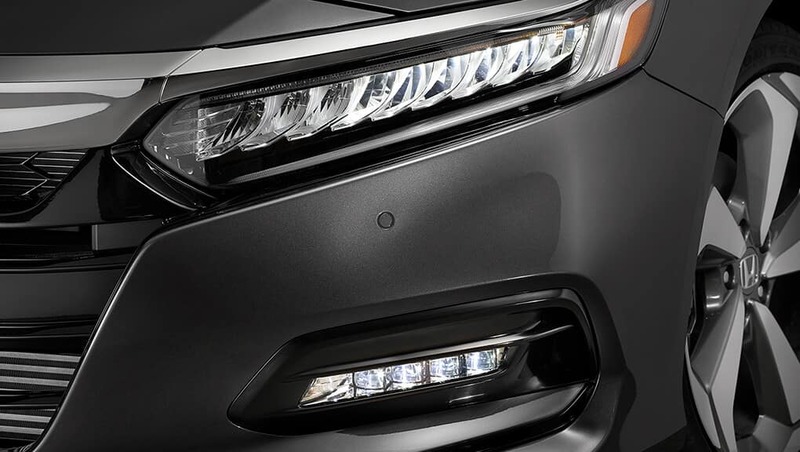 When the forecast calls for fog, the LED fog lights are designed to help you see more clearly. 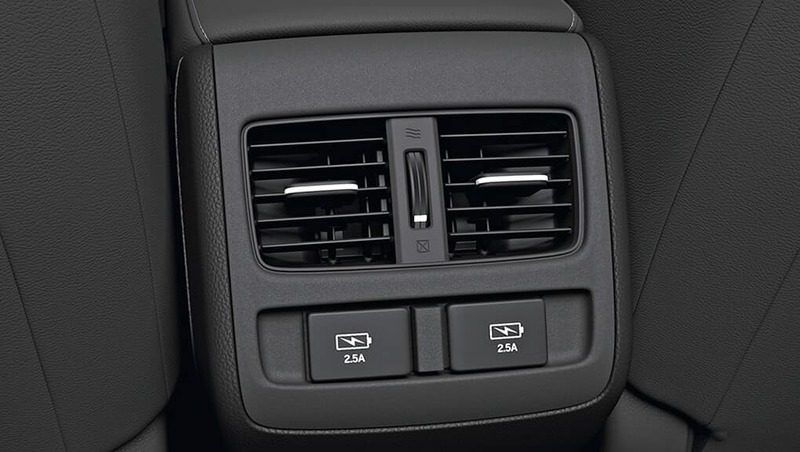 At the simple push of a button, the available one-touch power moonroof with tilt feature will fully open or close. The tilt feature allows for controlled ventilation and the sliding shade lets you control the amount of light you let in. Dual exhaust with available chrome finishers. The dual exhaust with available chrome finishers are the perfect outlet for those with a passion for both driving and style. 60/40 split fold-down rear seatback and 12-way power driver’s seat. The rear seats add convienience with the 60/40-split fold-down capabilities, while the driver’s seat adds support with 12-way power adjustment including 4-way-adjustable power lumbar support, making your seats more than just something to sit in. Heated front and available heated rear seats. 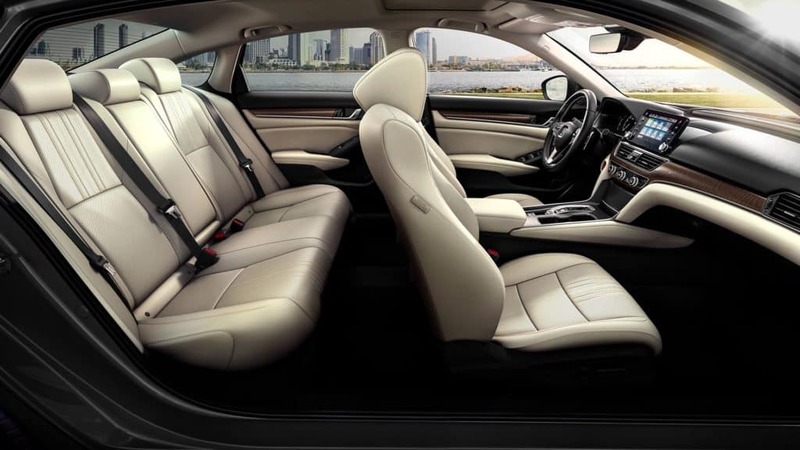 The available heated rear seats and standard heated front seats with available ventilation provide that extra touch of warmth for cold days. Available heated leather-wrapped steering wheel. The available heated leather-wrapped steering wheel keeps your hands warm as they grip the wheel, which is designed to look as good as it feels. 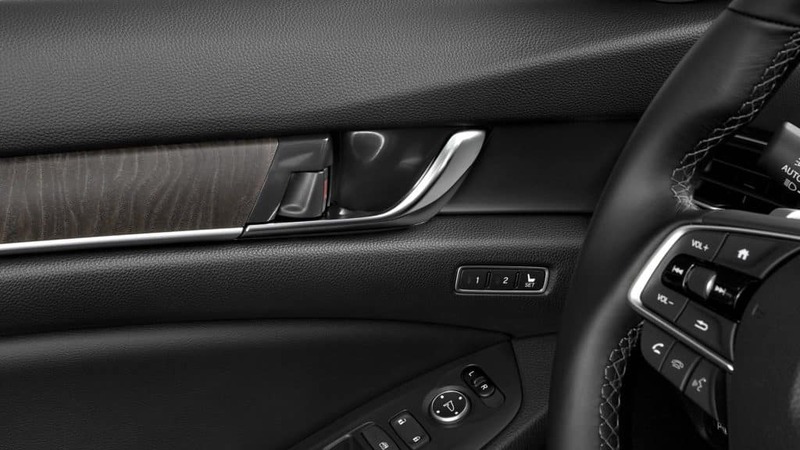 Appreciate the finer details with the available leather shift knob. Proximity key entry system with pushbutton start and available remote engine starter. 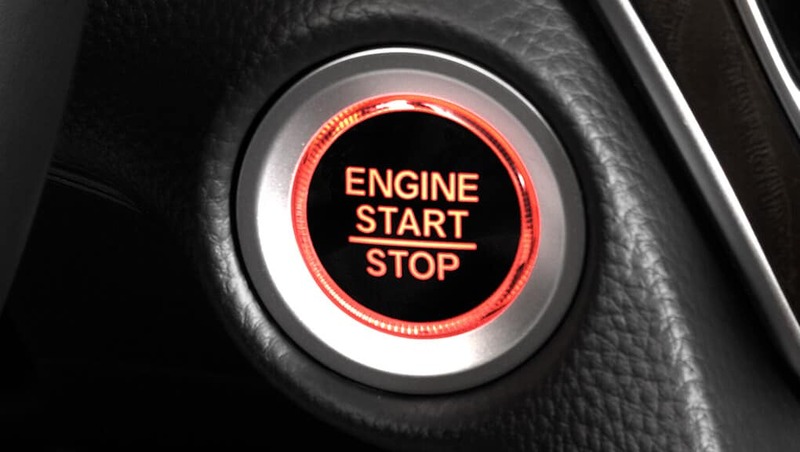 The proximity key entry system with pushbutton start and available remote engine starter lets you start your engine before you even get in, allowing you to get the temperature just right. 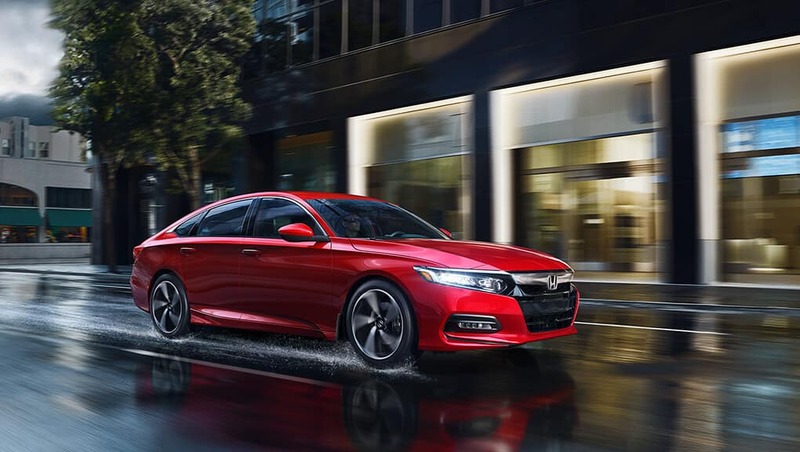 The 2018 Accord has virtually everyone’s needs in mind. It features two available rear 2.5-amp USB ports* to ensure your passengers’ compatible phones are charged and ready to go. 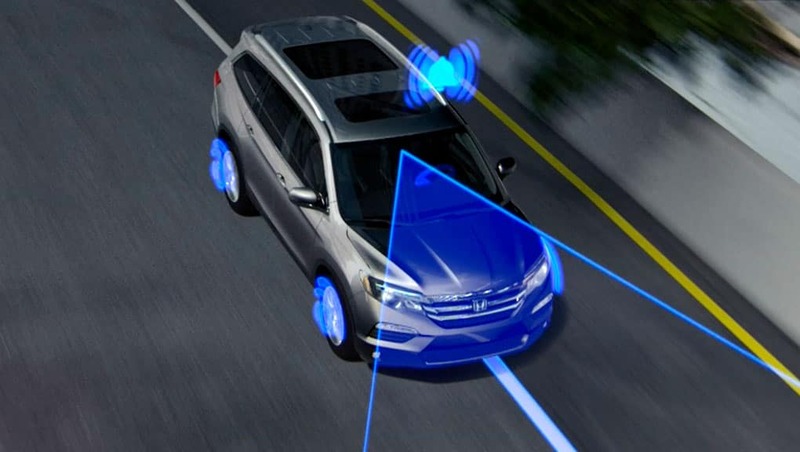 The Honda Sensing™ Technologies come standard, and are designed to help make your drive safer. With intuitive technology and design, we’ve created a way forward that we can all feel good about. 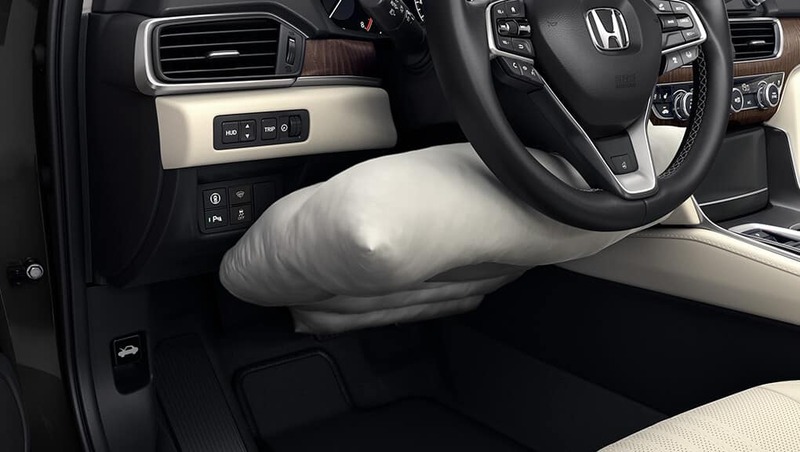 Whether you’re driving or sitting in the passenger seat, feel confident with the safety of driver assistive innovation from Honda. Collision Mitigation Braking System™ (CMBS®). 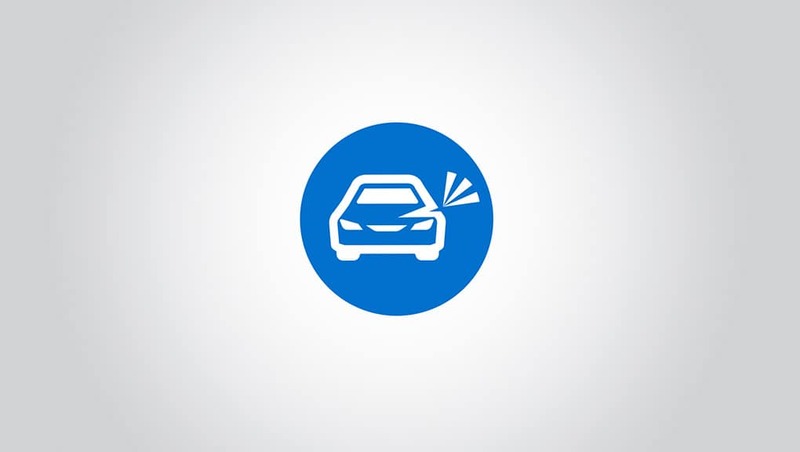 To help reduce the likelihood or severity of a frontal impact, the CMBS® is engineered to apply brake pressure if you don’t slow down when it senses you’re at risk of a collision. If it still senses an imminent collision, CMBS®). is designed to brake firmly. U.S. Honda Pilot model is shown for illustrative purposes only. The FCW system is designed to detect the presence of vehicles in front of you and issue alerts if you’re approaching with too much speed. The available LKAS is engineered to gently correct your steering if you begin to leave a detected lane without signaling, applying torque progressively to the steering to help guide you back to the centre of the lane. Road Departure Mitigation System (RDM). 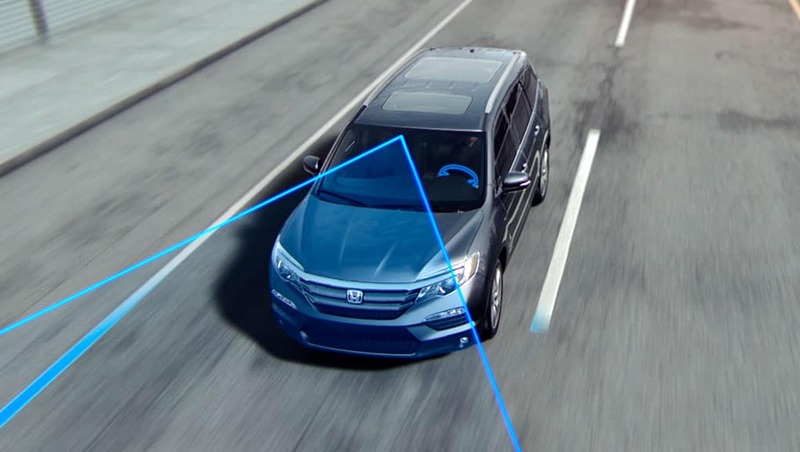 The available RDM system is designed to help steer and even apply the brakes to help keep the vehicle from leaving the road. The available ACC system is designed to keep a set speed and set following interval behind the vehicle detected ahead of yours. The available LDW system is designed to monitor vehicle lane position and alert you when your vehicle drifts into a newly detected lane when you haven’t signaled. 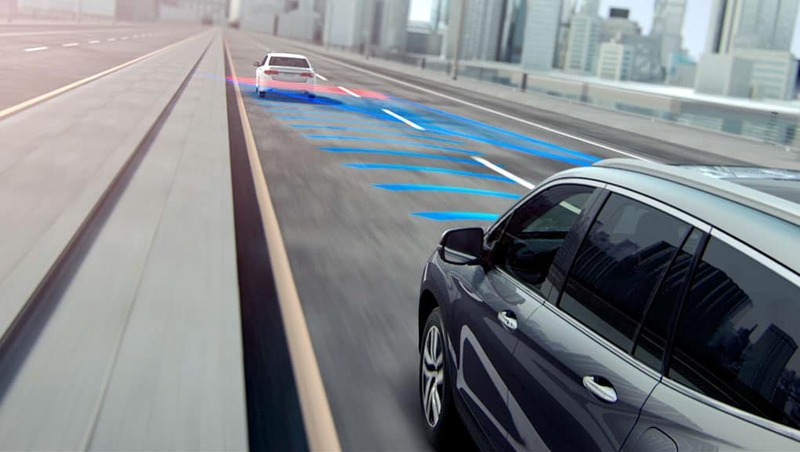 Adaptive Cruise Control (ACC) with Low-Speed Follow (LSF)†. The available ACC system with Low-Speed Follow* is designed to keep a set speed and set following interval behind the vehicle detected directly ahead of yours, including the ability to start and stop the vehicle with the flow of traffic. 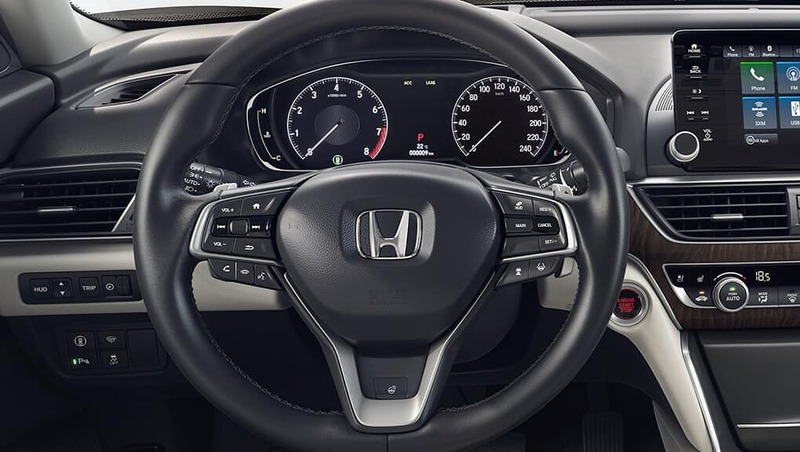 †Low-Speed Follow is not applicable on manual transmission trims with Honda Sensing™ safety and driver assist features. 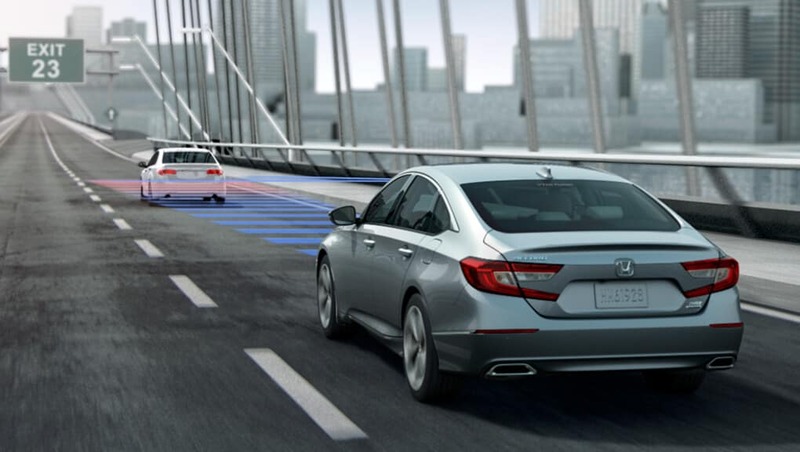 With the traffic sign recognition system, your Accord uses the monocular camera to detect traffic signs before you do, keeping you informed on the Driver Information Interface or the available head-up display. 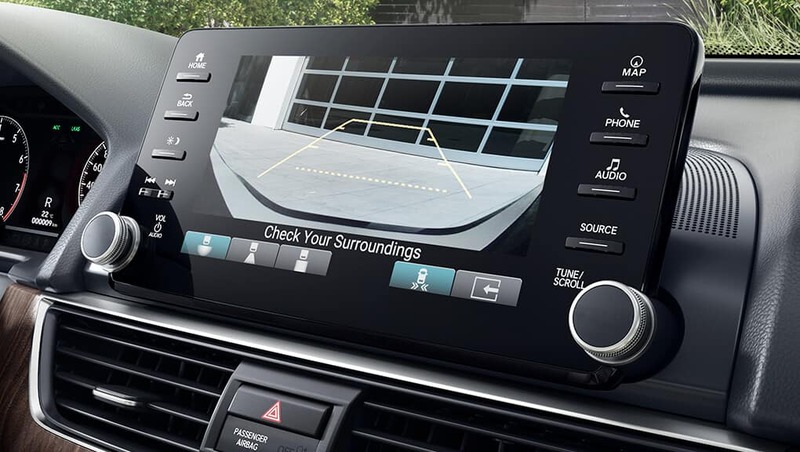 With the help of the multi-angle rearview camera with dynamic guidelines, you’ll feel more confident backing into even some of the most difficult spaces. 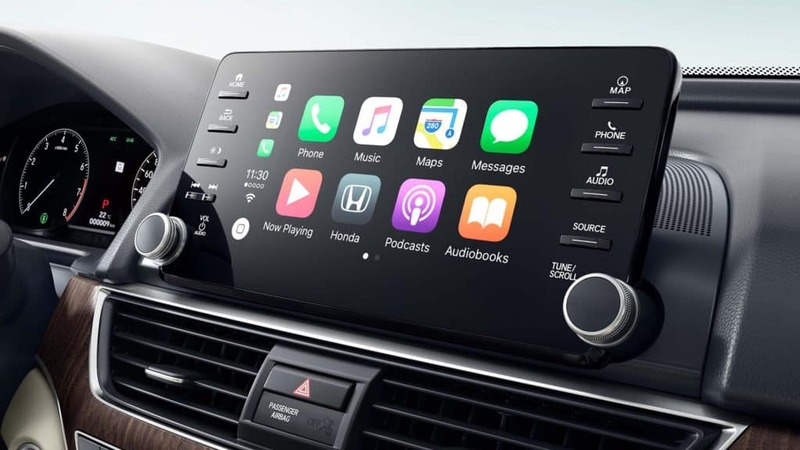 The 8″ Display Audio System touchscreen featuring Apple CarPlay™ and Android Auto™ compatibility helps to keep you connected to your music and your loved ones. Just swipe, tap, and go. 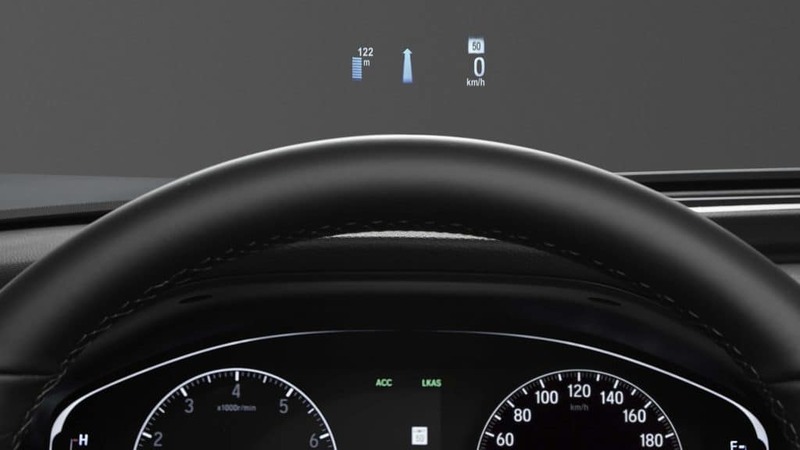 With the available Head-Up Display (HUD), selectable navigation information, speed and traffic signs are subtly projected into your line of sight on the windshield. Available Honda LaneWatch™ blind spot display. 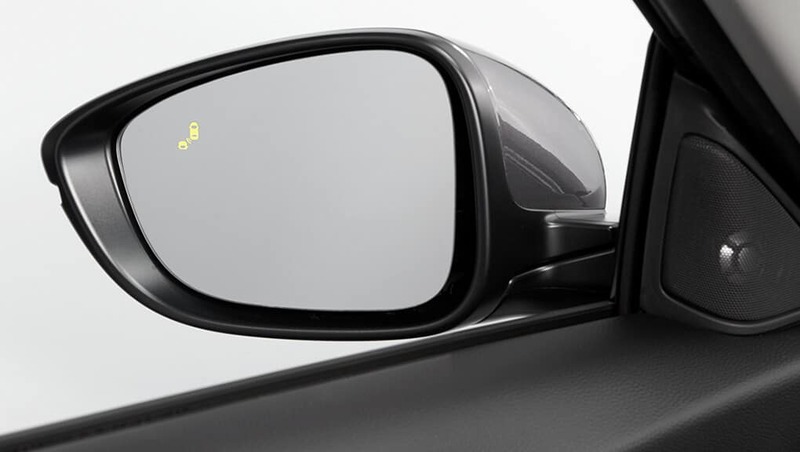 The available Honda LaneWatch™ blind spot display is engineered to send a live video feed from a camera mounted under your passenger-side mirror to your Display Audio System, which is designed to show close to four times more visibility than a side mirror alone. Available BSI with Rear Cross Traffic Monitor system. 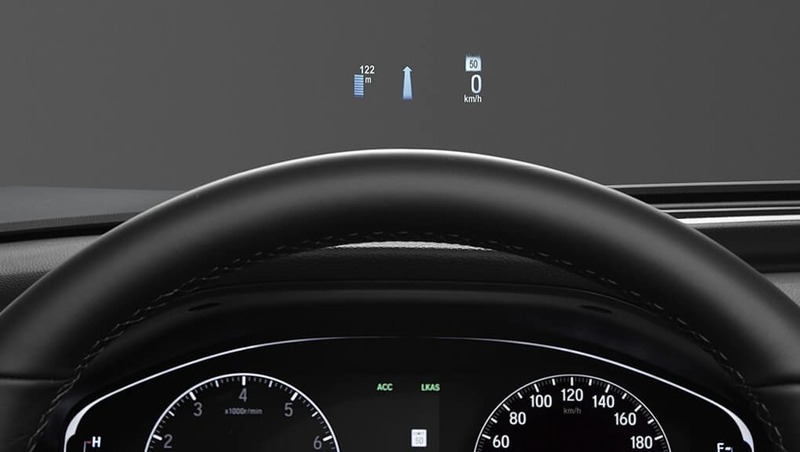 The available Blind Spot Information (BSI) system with Rear Cross Traffic Monitor system uses radar sensors that are engineered to illuminate indicator lights to notify you of vehicles entering either blind spot during lane changes, and displays an alert on the Display Audio System screen when a vehicle is detected crossing your path on either side as you are reversing. 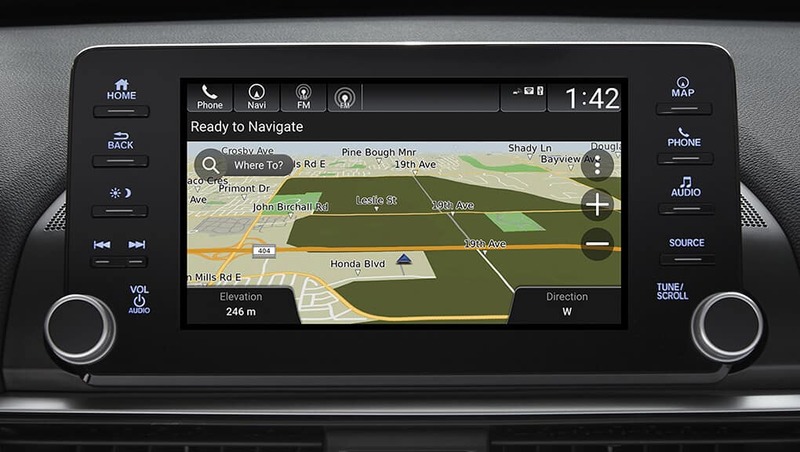 Available Honda Satellite-Linked Navigation System™. 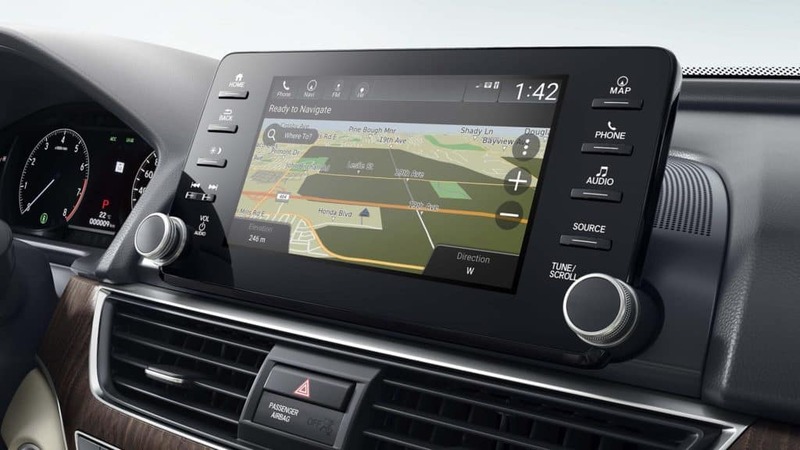 The available Honda Satellite-Linked Navigation System™ comes with bilingual Voice Recognition and uses the Display Audio System* to display your route. 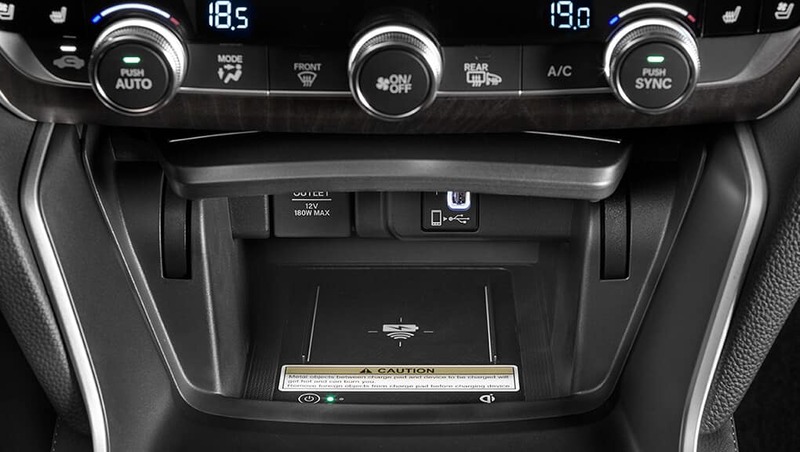 Available 452-watt AM/FM Premium audio system. 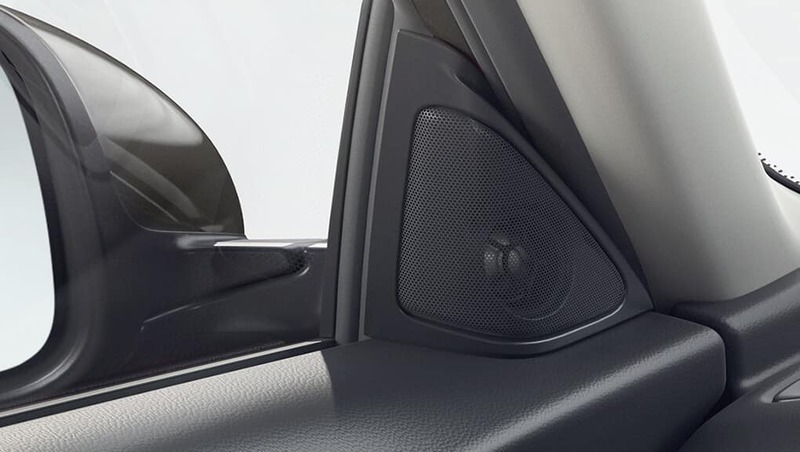 Rock out in your Accord with the available 452-watt AM/FM Premium audio system with 10 speakers, including a subwoofer. 7″ colour TFT meter display with Driver Information Interface. 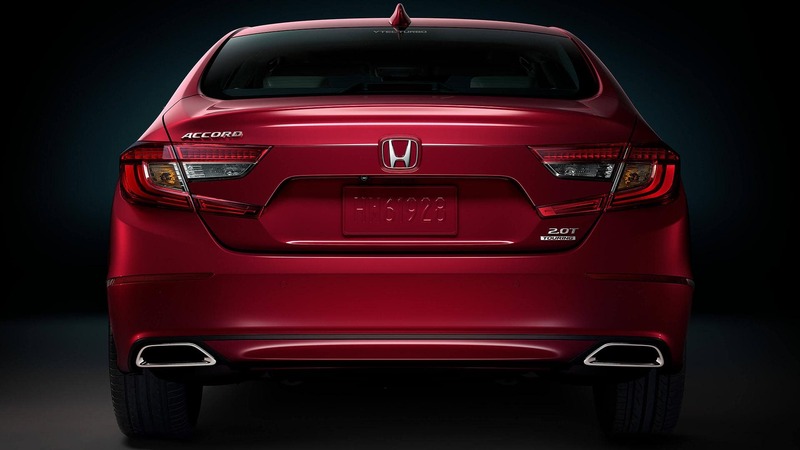 Get to know your Accord better. The standard 7″ colour TFT centre meter display with Driver Information Interface shows your audio and phone info, vehicle warning messages, navigation, safety support, trip range and settings. Skip the hassle and risk of fumbling with cords by charging your compatible smartphone with the available wireless charging pad. 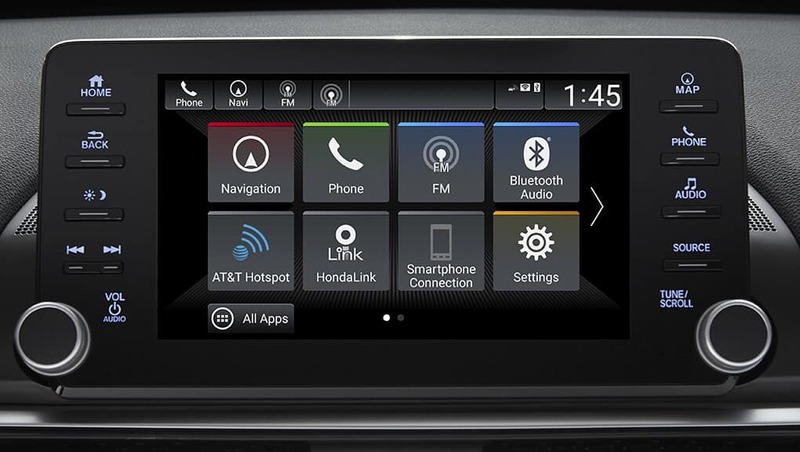 Connect up to 7 compatible devices with your vehicle’s available built-in Wi-fi hotspot. Enjoy up to 4G LTE speeds on multiple devices. 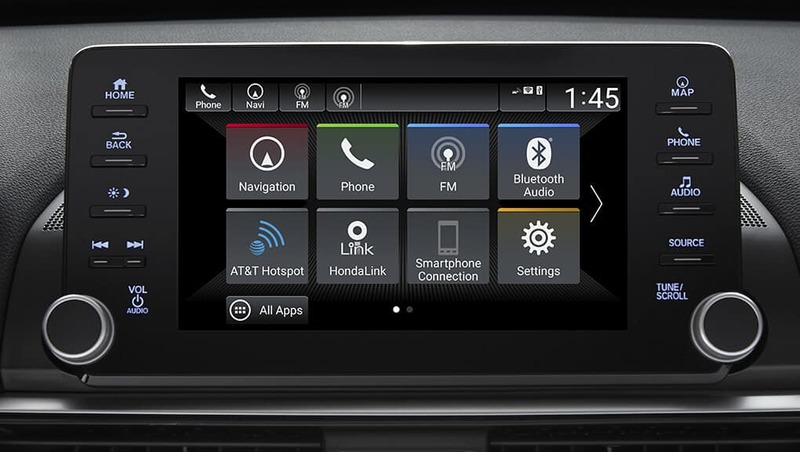 From the open road, you’ll be able to stream hours of videos, play games, get real-time email access and surf the web. 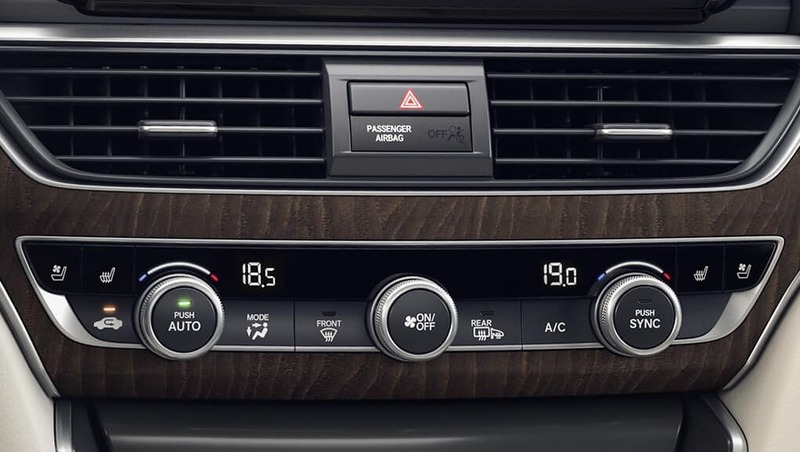 You’ll be able to stay connected up to 50 feet away from your Accord. The 6-speed manual transmission for both turbocharged engines lets you fall in love with the clutch all over again. 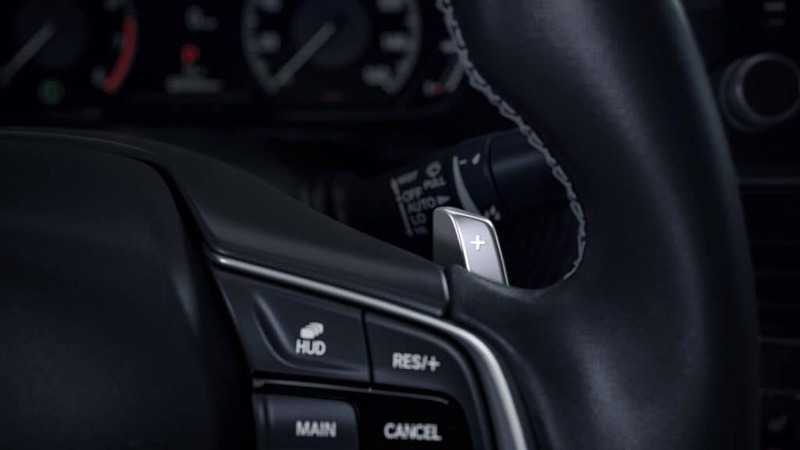 Available steering wheel-mounted paddle shifters. 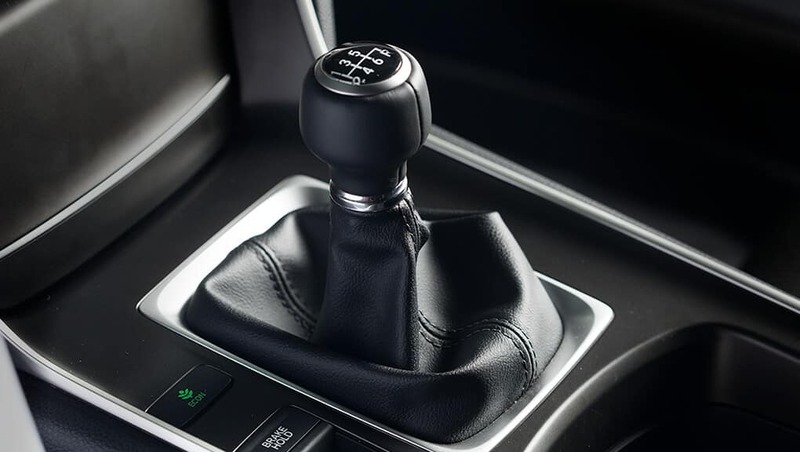 If you’d rather skip the shift and just drive, the available continuously variable transmission (CVT) can do the thinking. The available steering wheel-mounted paddle shifters give you the freedom to get more involved if you’re feeling eager. 1.5-litre, 16-valve, turbocharged 4-cylinder engine. 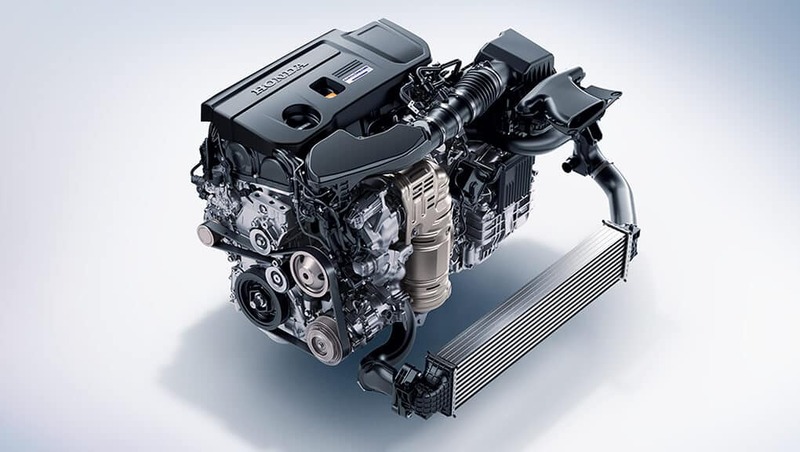 The 1.5-litre, 16-valve, Direct Injection, DOHC, i-VTEC® turbocharged 4-cylinder engine with 192 lb.-ft. of torque* is a healthy serving of get up and go, with more than enough power to get you where you need to go. 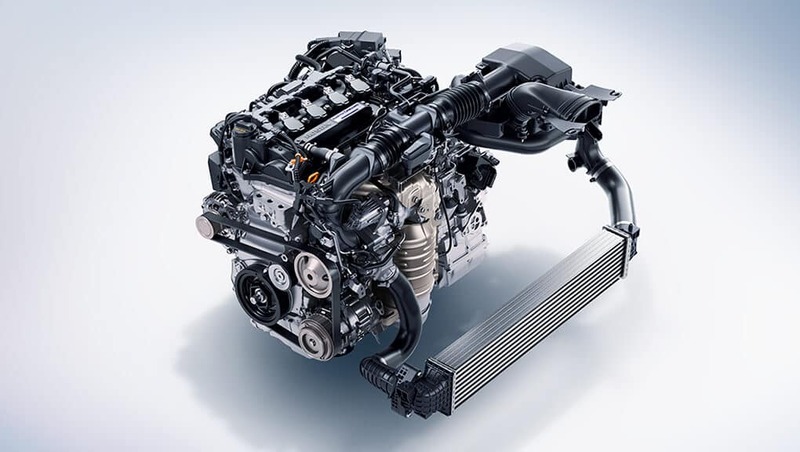 Available 2.0-litre turbocharged 4-cylinder engine. 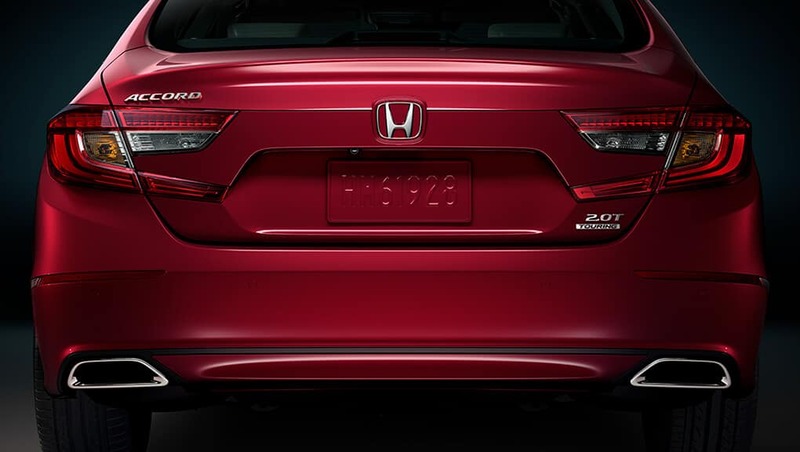 The available 2.0-litre, 16-valve, Direct Injection, DOHC, i-VTEC® turbocharged 4-cylinder engine with 273 lb.-ft. of torque* offers a powerful way to conquer any road. 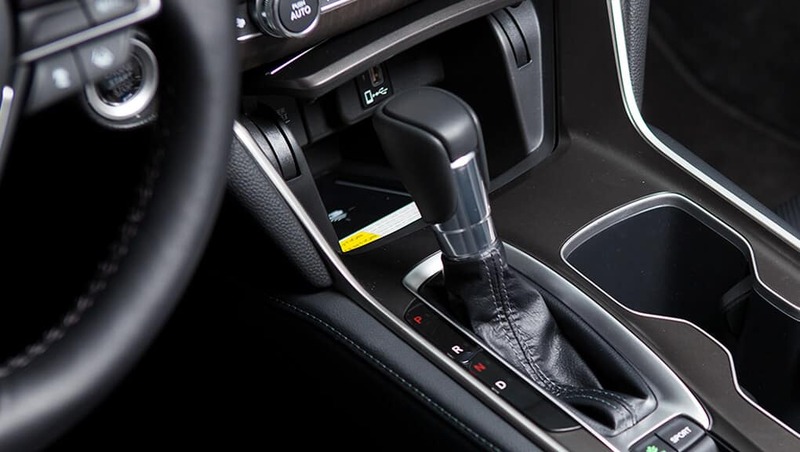 With the available 10-speed automatic transmission (AT) with Grade Logic Control, gain exceptional control along with improved fuel economy ratings. If driving is a sport, this is how you play. Engage the Sport mode button to create a dynamic handling experience you need to feel to believe. A drive that suits your style. 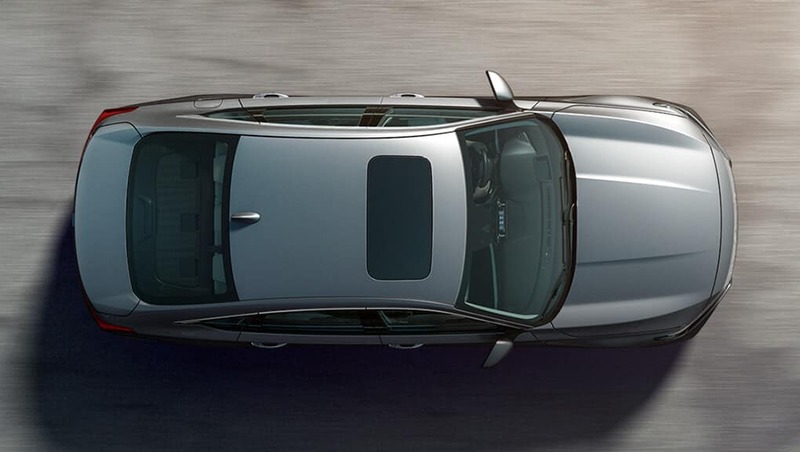 Use the Adaptive Damper System to adjust the damping force for true driving comfort. In Sport mode, ADS is engineered to tune the suspension to help deliver precision around every turn, while Normal mode helps to provide a softer ride damping for a more seamless drive. Electric Parking Brake (EPB) with automatic brake hold. 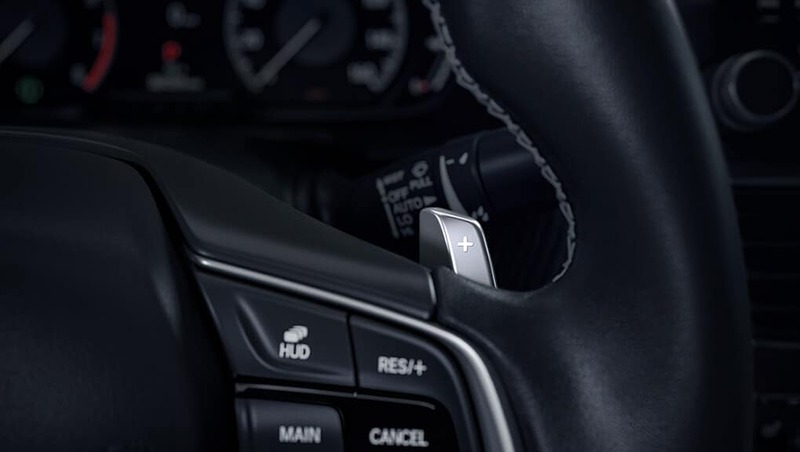 With the lift of a button, it’s never been easier to engage and disengage the parking brake, while the automatic brake hold feature is engineered to make stop-and-go traffic easier by engaging the brakes at a stop even after the brake pedal is released. 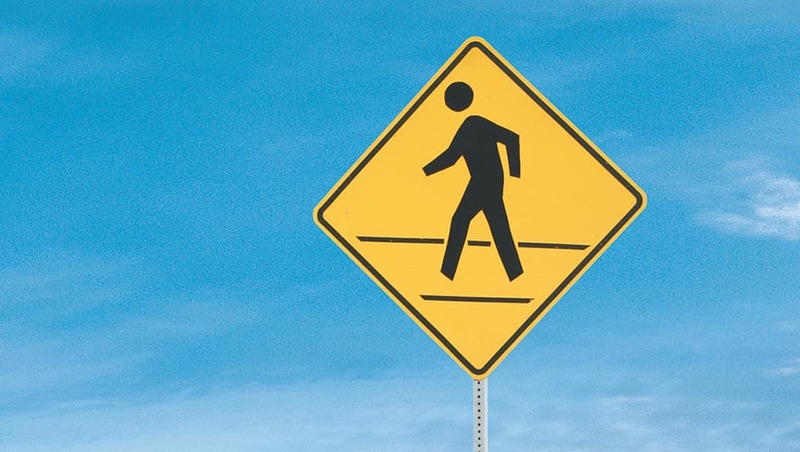 At Honda, we strive to provide a high level of standard safety features to help ensure the safety of occupants, other drivers and even pedestrians. With this added peace of mind, our drivers have the confidence to enjoy every road to the fullest. To assist with safe stopping, the 4-wheel Anti-lock Braking System (ABS) is designed to help you maintain control under hard braking conditions, while Electronic Brake-force Distribution (EBD) helps to optimize braking power based on weight distribution inside the vehicle. In addition, Brake Assist is engineered to help improve braking performance by applying full brake pressure when a panic stop is detected. To promote enhanced safety and fuel efficiency, the Tire Pressure Monitoring System is desiged to continually check the air pressure in each tire. If pressure drops in any tire, the driver receives a dashboard alert. 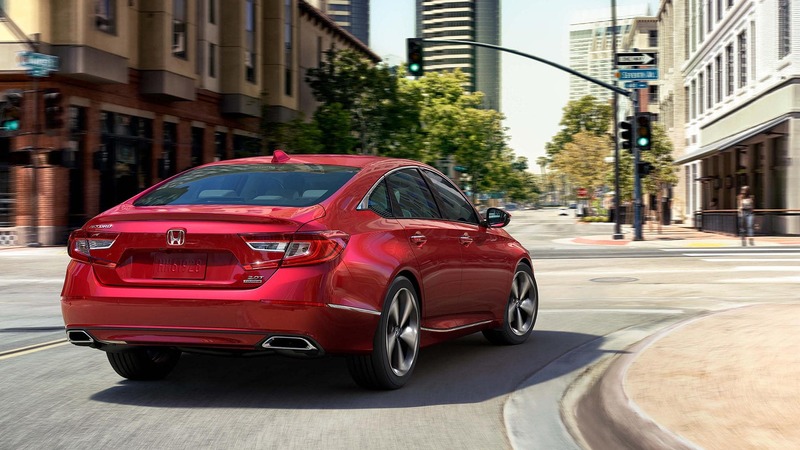 If you take your foot off the brake when stopped on an incline, this feature is engineered to temporarily maintain brake pressure to help prevent your Accord from starting to roll backwards. 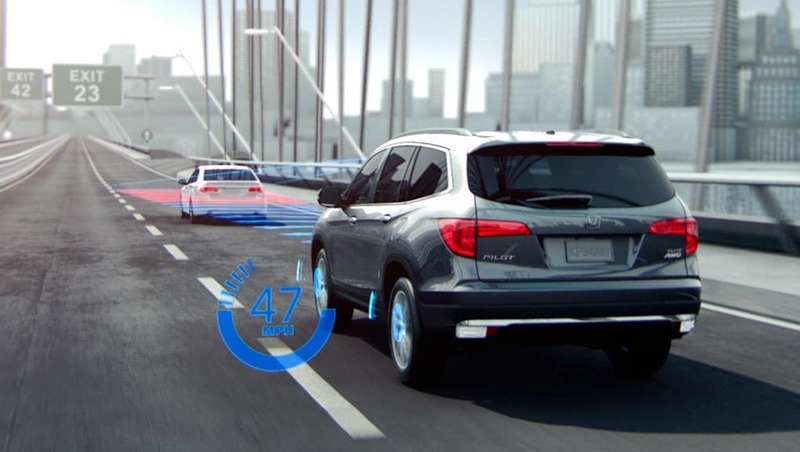 Vehicle Stability Assist (VSA®) with Traction Control. 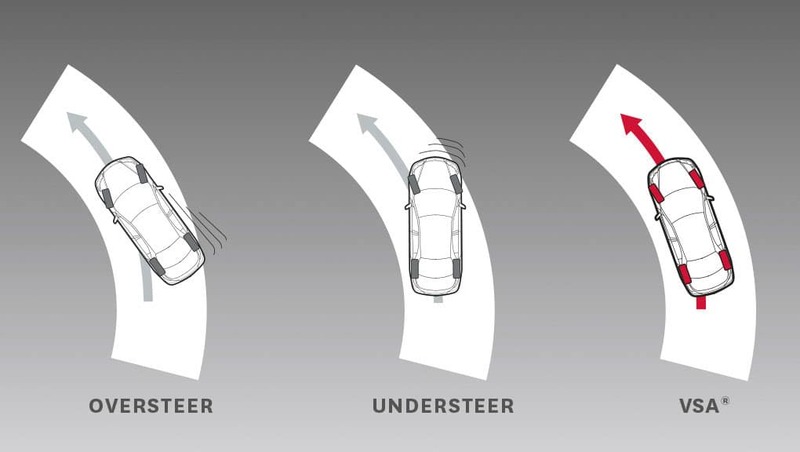 Vehicle Stability Assist with Traction Control is designed to sense and help correct oversteer and understeer scenarios to enhance handling and cornering stability, while Traction Control is designed to minimize wheel spin when accelerating on loose or slippery surfaces, helping to inspire greater driver confidence. 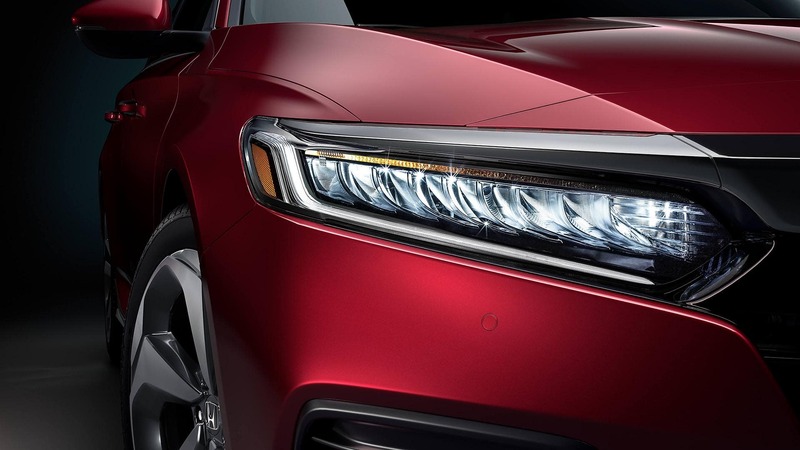 The auto high beam feature automatically changes the low beam headlights to high beam headlights in certain circumstances to help improve your vision. The highly innovative, next generation Advanced Compatibility Engineering™ (ACE™) body structure is engineered to help disperse frontal impact energy to enhance occupant protection, while more effectively controlling it in severe collisions to help prevent intrusion into the passenger cabin. 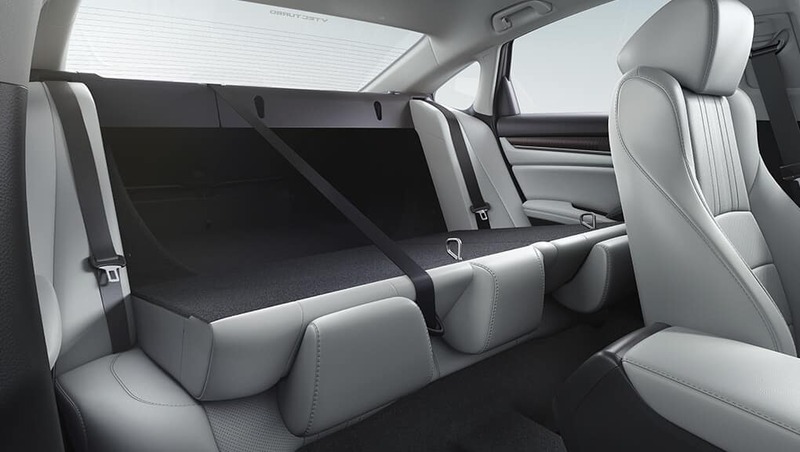 The Accord helps prepare you for the unexpected with 3-point height-adjustable front seat belts with automatic tensioning system and 3-point rear seat belts. 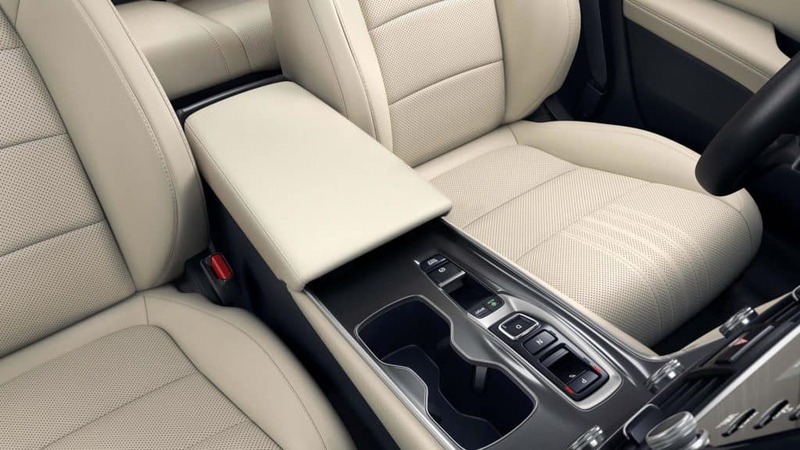 The Accord features childproof rear door locks, as well as rear seat Lower Anchors and Tethers for Children (LATCH), which give you a simple and convenient method to install compatible child safety seats without using the vehicle’s seat belt system. Innovative pedestrian safety features include an energy-absorbing hood and front fenders and deformable wiper pivots. 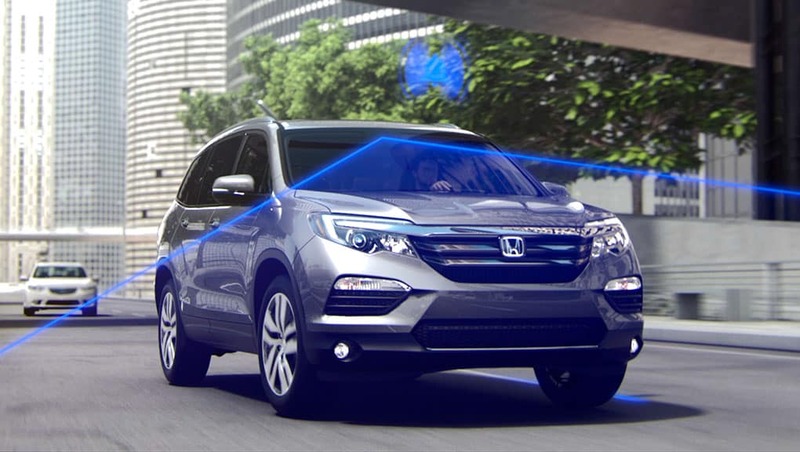 HondaLink™ Assist Automatic Emergency Response System. 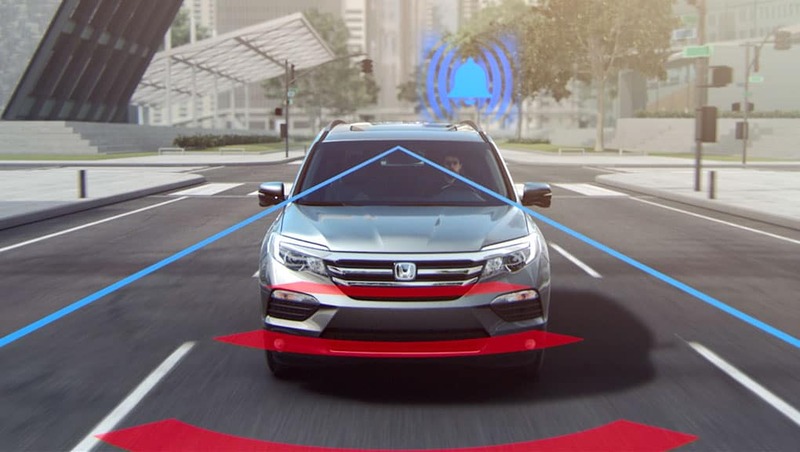 The HondaLink Assist Automatic Emergency Response System helps you get the help you need when you need it most. 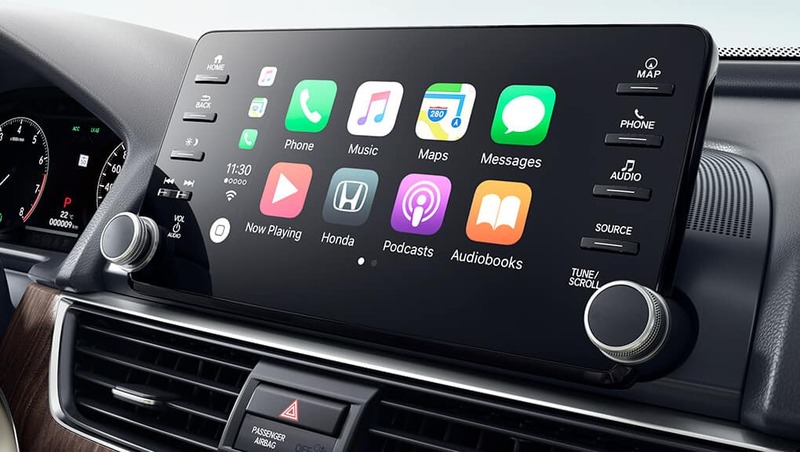 If the airbags deploy, your Display Audio System is designed to automatically attempt to put you on a call with an operator who will forward your location to first responders if needed. 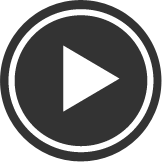 It works with any compatible Bluetooth®-paired phone as long as it has reception, does not require a subscription and gives you added peace of mind while you’re on the road. 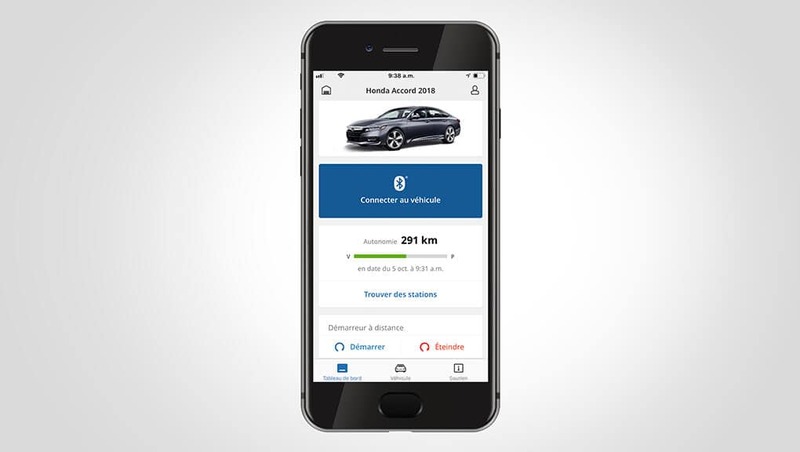 The available HondaLink™ Subscription Service helps connect you to a world of features both inside and outside of your vehicle, adding convenience and security to your ownership experience. Start your Accord before you even get in. With the available remote engine start, you can start your car before entering to warm it up in the winter or cool it down in the summer. 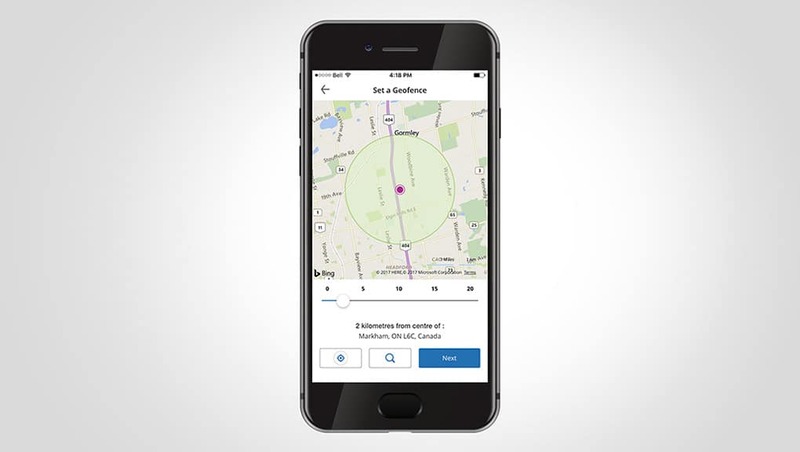 Easily pinpoint your car’s exact location from almost anywhere. 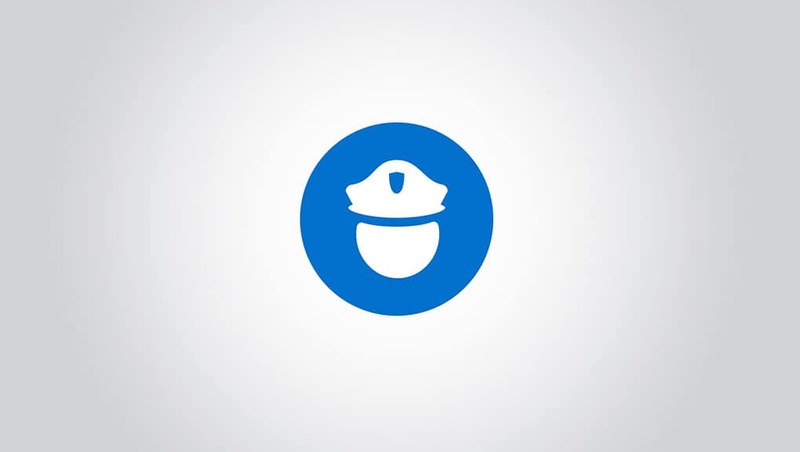 In the event of an accident, a Response Agent automatically checks in, and helps send emergency care, even when passengers aren’t able to respond. 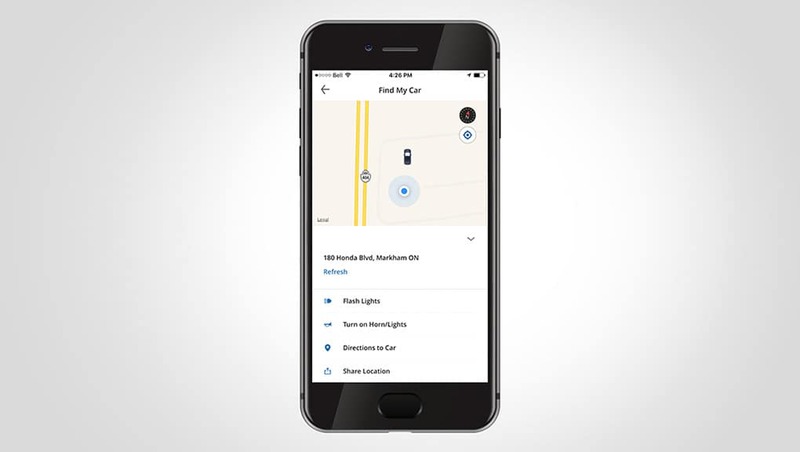 Users can remotely lock or unlock the car doors using the app. 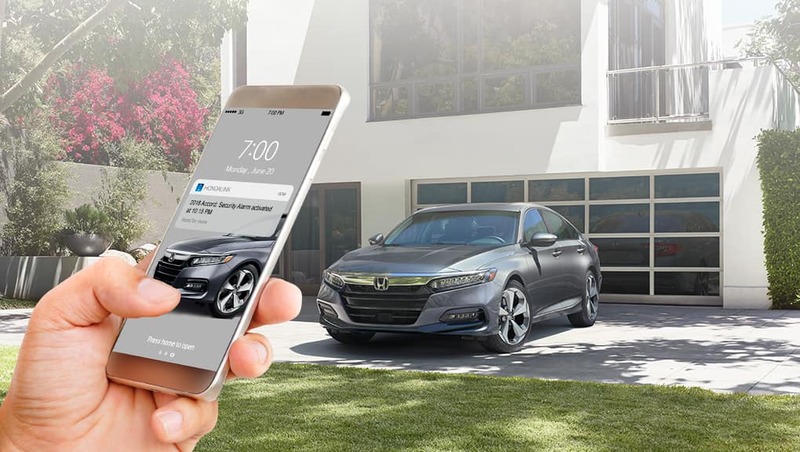 Whether you’re locked out or forgot to lock up, count on quick, keyless entry and remote assurance from almost anywhere. If driving is a sport, this is how you play. 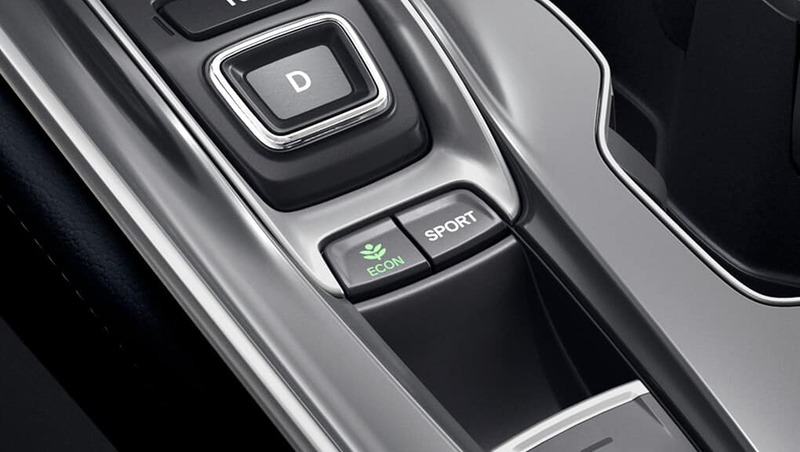 Engage the available Sport mode button to create a dynamic handling experience you need to feel to believe. Go further with the available Adaptive Damper System to adjust the damping force for true driving comfort, tuning the suspension to either help deliver precision around every turn or provide softer ride damping for a more seamless, comfortable drive. 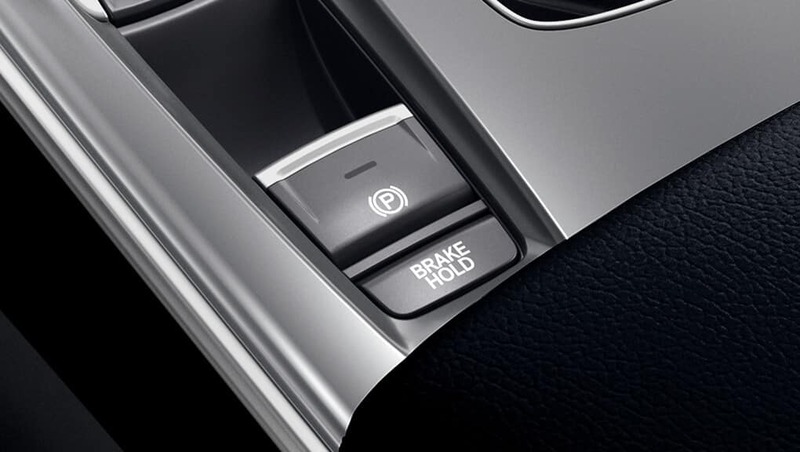 In slower conditions, the automatic brake hold feature makes stop-and-go traffic more convenient by engaging the brakes at a stop even after the brake pedal is released. 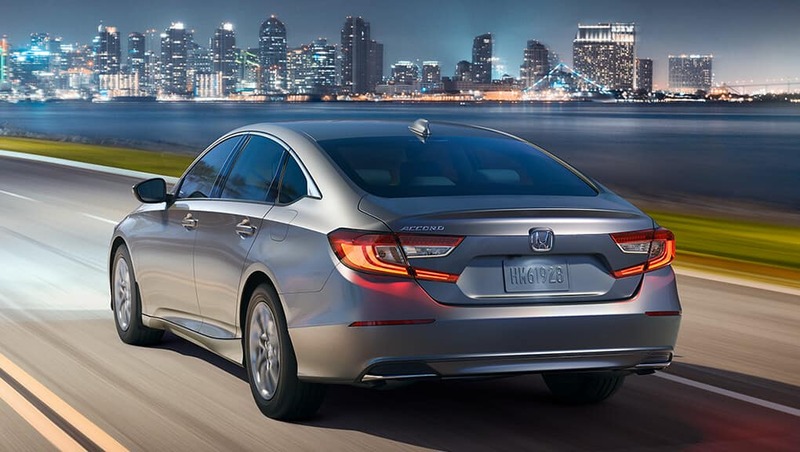 The road is long, and that’s just the way the Accord likes it. 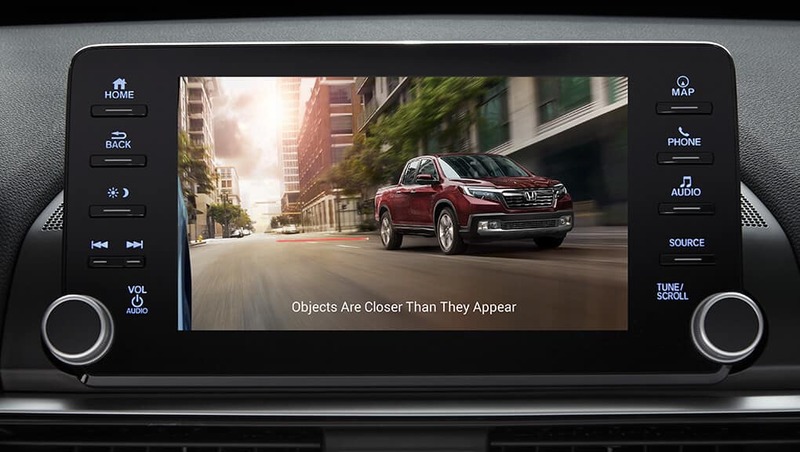 Safety-wise, the multi-angle rearview camera1 with dynamic guidelines is engineered to have your back, while the available head-up display (HUD) is designed to project helpful information into your line of sight on the windshield, from speed to navigation to speed limit signs. 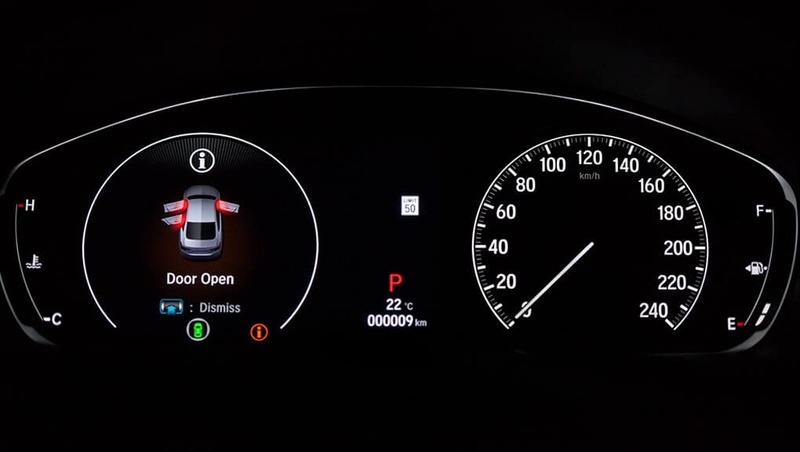 The Accord also boasts a standard 7″ colour TFT meter display with Driver Information Interface, showing your audio and phone info, vehicle warning messages, navigation, safety support, trip range and settings. 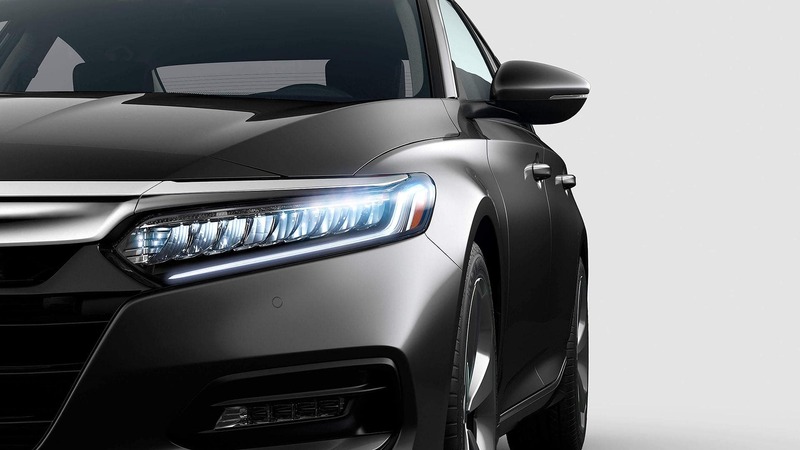 With the Accord, Honda’s latest tech is now in reach. 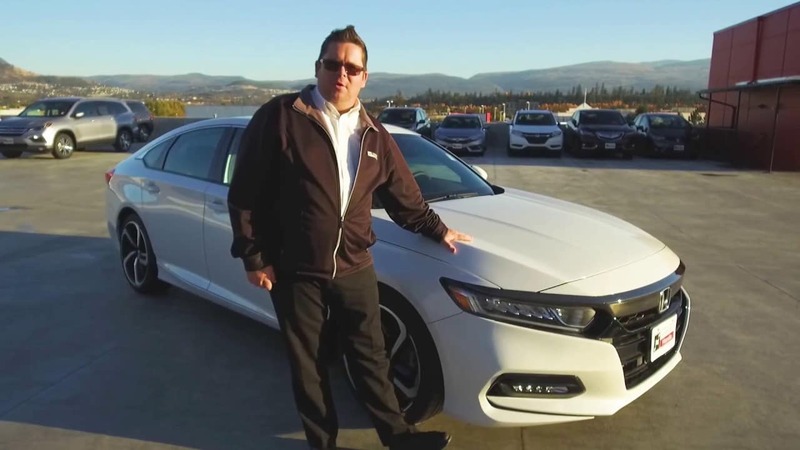 A test drive in the 2018 Honda Accord Sedan for Kelowna, West Kelowna and Penticton awaits at Harmony Honda! 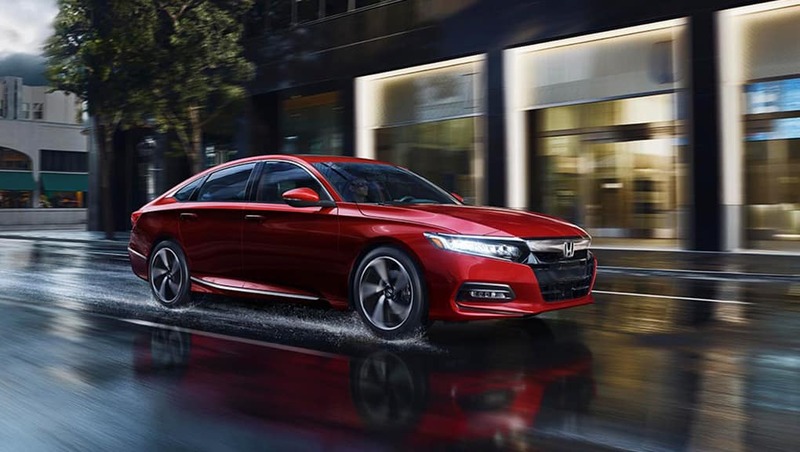 Contact Harmony Honda to make your appointment for a test drive in the 2018 Honda Accord Sedan. *Value does not include freight, PDI, applicable taxes, license, registration, levies and fees. For province-specific pricing, please refer to Build & Price. **Fuel consumption for comparison purposes only and may vary with usage and accessories. See dealer for latest EnerGuide results published by Natural Resources Canada (when available).